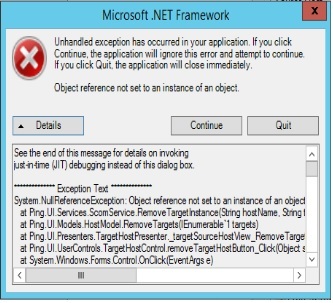 Our OpsLogix Ping Management Pack randomly stopped working and the error is posted below (anyone seen this before?). So, the plan is to remove this Management Pack and re-add, however, we must remove the dependencies first. We’ve taken care of most of them but the Management Pack that contains information related to our Distributed Applications has 100+ references for OpsLogix because we use many Distributed Apps that each refer to a OpsLogix Ping monitored device. Instead of editing out the many references, should we just delete that Management Pack altogether, re-install the Ping Management Pack, and import the backup of the Management Pack again? We use Distributed Applications for one of our most important dashboards, so we want to ensure that we won’t lose anything by deleting out the associated Management Pack temporarily. Can you send the whole error please! Also, "object reference not set to an instance of an object" tends to mean that something (an object) was removed. Did you have a source agent that has now been removed? I have updated the post with the error message as well as a similar complaint I saw online. No source agent was removed. Did you ever get a resolution of this? I am all the sudden having this issue now too. Silly question, but have you reached out to OpsLogix? I did send them a message about it but received no response. The Management Pack has worked fine for years and works in our other Management Group so it's hard to say if the issue is necessarily the Management Pack itself. Yes but it was not pleasant. I had to backup Management Packs, remove dependencies, and remove the OpsLogix Management Pack. I then re-installed the OpsLogix Management Pack, restored Management Packs I had removed, and import devices again with a CSV file. All our Distributed Applications and Groups had to be verified again to get back to how they were before the issue appeared. Oh man, that doesn't sound fun. Did they ever tell you what caused it? The only thing that I can think of for me is that I imported a set of servers for a new office and there was a blank line that went into the list, from that moment on, I couldn't delete. I never received a response from OpsLogix. I think one of my teammates inadvertently imported or added a device with some non-typical characters and that may have caused it. I still plan on testing this by trying to break it in our development SCOM environment, I just haven't gotten to it. In the meantime, extra care is taken to ensure there are no special characters or blank spaces when adding devices. It may be a bit sensitive to that kind of thing, so your scenario sounds similar to ours.